The Blues & Royals practising for this year's special birthday parade in Hyde Park, London. The Queen’s Birthday Parade may happen every June but there is no doubt that this year’s Trooping the Colour will be a historical moment. Roger Field meets the men and the mounts from the Household Cavalry Mounted Regiment who will mark the 90th birthday of our Sovereign. The Queen’s natural affection for animals has been long and well known, particuarly for her “blacks”. 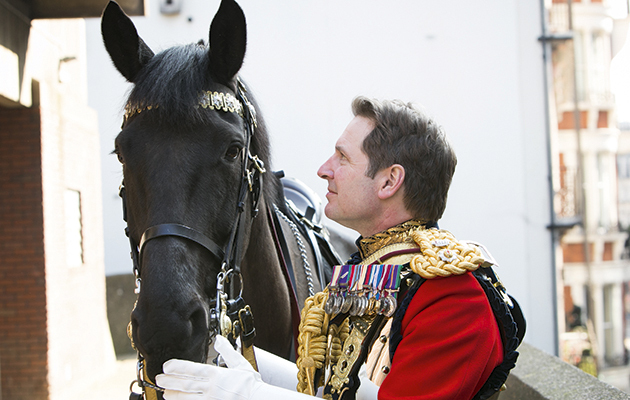 Read The Queen’s horses: black beauties of Knightsbridge to learn more about the special relationship Her Majesty has with her Household Cavalry. 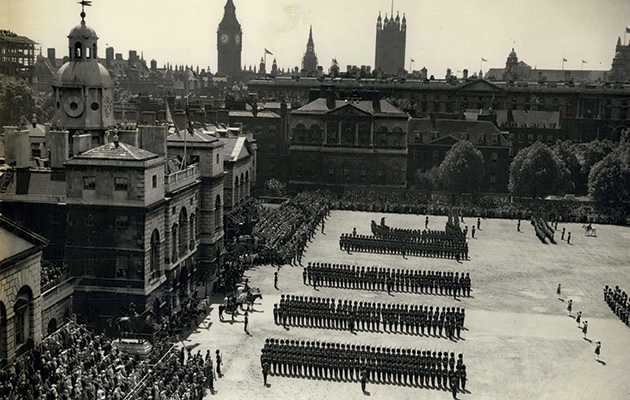 The Trooping the Colour ceremony on Horse Guards in 1957. 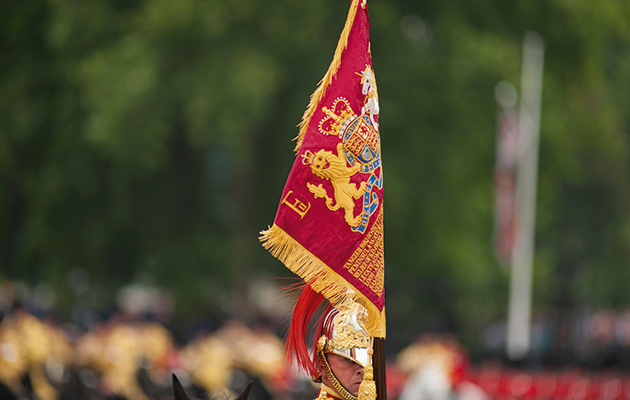 On Saturday 11 June more than 1,400 men and 200 horses, including 170 from the Household Cavalry Mounted Regiment, will “Troop the Colour” at The Queen’s Birthday Parade. The practice of Trooping the Colour goes back to ancient times when, usually just before a battle, that detachment’s standard or colour – the flag the fighting men knew to follow and rally around – was paraded along their ranks so everyone could get a good look at it so they could recognise it once the action started. What began as a pre-battle drill had, by 1748, been transformed into an annual parade to celebrate the sovereign’s birthday. Fast forward to Edward VII, who started the tradition of taking the salute in person. And so, this June, Great Britain’s own Birthday Girl will be celebrating her 90th birthday parade, an event she has only missed once, in 1955, when a railway strike forced Horse Guards to cancel it. 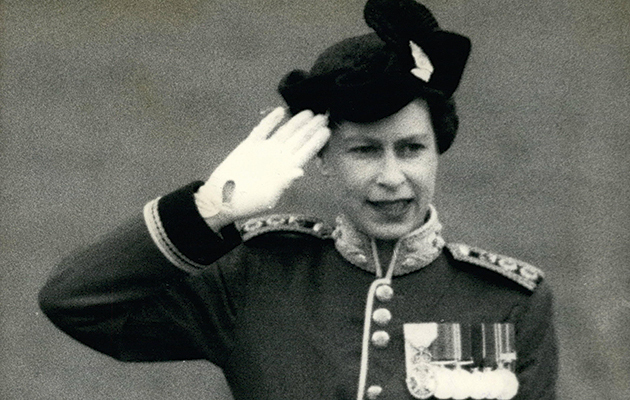 HM The Queen taking the salute on 6 June 1958. Meanwhile, at Hyde Park Barracks in Knightsbridge, Lieutenant Colonel James Gaselee, The Life Guards, tells me he has been aware of various ideas floating around to, perhaps, “do something special” but, as far as he is concerned, it is business as usual. This is another Queen’s Birthday Parade and he would be surprised if Her Majesty would want anything different on the day. This will be his first parade as Commanding Officer, HCMR – comprising of a squadron each of The Life Guards and The Blues & Royals – my old regiment, as it so happens. No stranger to Knightsbridge, Colonel James also did tours as a troop leader (lieutenant) and then squadron leader (major). He will be riding Oracle, his six-year-old charger, on his first Queen’s Birthday Parade. “A bit young?” I wondered. Colonel James, an experienced horseman, is relaxed and certainly, looking splendid as he posed for photographs, Oracle looked equally relaxed, too. Lt-Col James Gaselee, Commanding Officer, HCMR. Finding a genuinely black horse is genetically difficult and most have a bit of white in them. Those that are all black – or more black than most – and usually finer boned, will be earmarked as officers’ chargers, though not all will make it. A charger has to be prepared to lead and act independently, while the troop horses are trained to follow. And they do. Only when you have tried to make a troop horse turn in a different direction to the herd will you understand just how implacable they are. Of course, this relentlessness was once invaluable in battle. The horses charged together and stayed together regardless and, as Colonel James explained, the troop horses know the drills and routines better than many of the new recruits. A confused trooper on his first parade on an experienced “black” will perform the correct manoeuvres despite himself. Which is a useful attribute because whereas in my day other ranks tended to go either “mounted” or “service” (armoured) and pretty much stay there, these days it is very different. Troopers joining the Household Cavalry will, unless they have some horse allergy, start their regimental career with the mounted regiment. After completing their basic military training (drill, weapons and endless PT – plus ça change), they will then go to Windsor for a 16-week riding course. The vast majority will not have ridden before. They spend 12 weeks in “khaki”, learning to ride, then the final four in state kit and learning to ride differently: sitting trot; riding one handed – the right hand carries the sword. 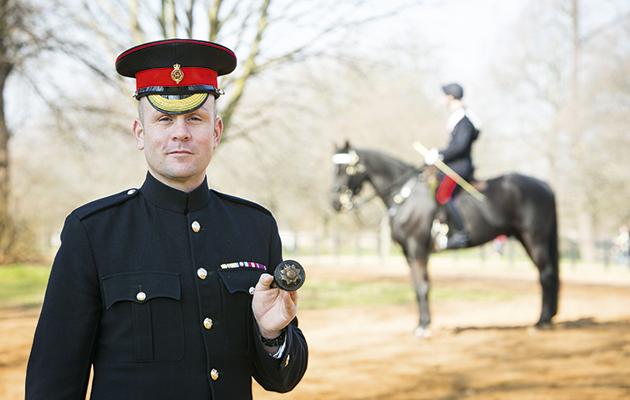 Given they then “pass out” – most do – they are then sent to Knightsbridge, where they start mounted duty almost immediately, although they will not be pitched straight into a major parade, such as The Queen’s Birthday Parade. They then do a two-year tour before being sent to the service regiment to start armoured training. That means, when you watch their impeccable drill on 11 June, around 40% of them will be doing it for the first time. The other half for the second time, and only a few – riding masters, farriers, senior NCOs and the officers – will be doing it for the third or more times: an astonishing testimonial to the standards of training and the quality and intelligence of the soldiers. Trooper Shaw explains that to do something stupid would let the whole troop down, something no trooper is prepared to do. And that is another thing that is different to my day, as both the Colonel and Squadron Corporal Major Edward Sampson, The Blues & Royals, explained. Back then, one secret of leadership success was to keep a soldier well away from booze or temptation before anything important was due to happen. The modern Household Cavalry soldier understands this and both men told me that it was extremely rare to have any problem with alcohol or absenteeism. This generation of soldiers just don’t do it. Trooper Shaw, who I chatted to, confirmed this. To do something stupid would let the rest of the troop down and he would not do that. He felt honoured to be where he was and would not jeopardise that. In fact, the rest of the troop would not let someone do something stupid as it would let them all down. They take far too much pride in who they are and what they are privileged to do. Of course, there’s always one or two but they quickly get found out and find themselves on their way. The Blues & Royals’ Sovereign Standard. A legacy, I suspect, from the long years of arduous and deadly tours the regiment did in both Iraq and Afghanistan. There was a story – perhaps apocryphal, perhaps not – that on the outbreak of war in 1939, Part One Orders (a notice on the Board saying what to do if…) at Knightsbridge stated that, in the event of German paratroopers landing in Hyde Park, Household Cavalry Regiment was to proceed to the park and hold it until “the military arrived”. How we laughed back then. No longer. In 1982, The Blues & Royals did exactly what was asked of them in The Falklands. A reputation that the Household Cavalry has more than maintained since. Even though the regiment does ceremonial duties, it is very much a proper fighting regiment and that old joke would fall flat today. In fact, and wonderfully, when SCM Sampson rides out onto Horse Guards, he will be carrying the Standard of The Blues & Royals on which are emblazoned its many battle honours, hard won over four centuries of fighting for the sovereign. One of those is “Iraq 2003”: his war, his battle honour. Not only did he fight as a Scimitar gunner but he saw a number of his friends killed and wounded, both then and in subsequent tours. He told me that, up until today, the proudest moment of his military career was as he rode down The Mall on his first Queen’s Birthday Parade in 2000. He suspects that moment will be surpassed when he carries the Regimental Standard with “his” battle honour, their battle honour, before his sovereign on her 90th Birthday Parade. He also promised to spare a thought for the 29 men of The Blues & Royals who ensured that “Falkland Islands 1982” is emblazoned above Iraq 2003 on that same standard – perhaps in itself a record for the least number of men who managed to win a regimental battle honour? SCM Edward Sampson will carry The Blues & Royals’ Standard. Astonishingly, the morning of The Queen’s birthday parade itself is relatively relaxed compared to some of the days that lead up to it. Rehearsals mean getting up at about 0200. That way the regiment can ride to Horse Guards, practise its drills and ride back to barracks before the traffic builds up and it brings Central London to an unscheduled standstill. But, on the day itself, there is a much more leisurely “Stables” at 0600. The horses are then given a short ride in the park to let off any excess steam. Then back in, final grooming and “Fall In” at 0900 hours. It takes about 15 minutes to get everyone “on top” with all their kit on and looking the part. Then comes the Colonel’s Inspection. There will be two to three “waiting men” on standby to take over in case anyone looks sub-standard: whether kit-wise or health-wise. And then at 1000 it is “Move out”. And from there they go about their drills as rehearsed. 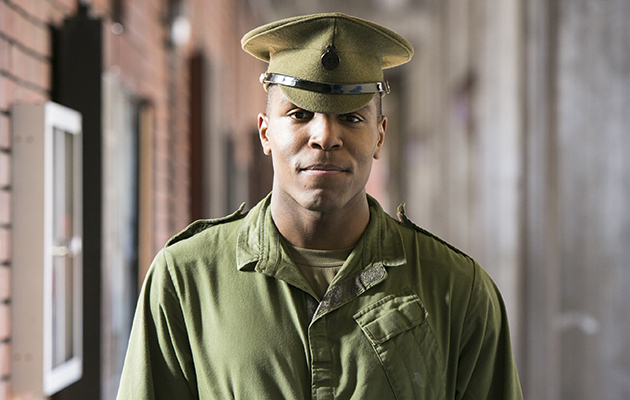 Colonel James explains that – given you know what you are about, of course – it is then relatively easy because, as he jokes, unlike the Foot Guards they don’t have to worry about keeping step. Officers know exactly where to aim for when they are riding as there are specific windows on Horse Guards that are specified “aiming points”. Just head straight towards said window, turn at the designated spot, then aim for the next window. Shouting orders – although commands when actually riding are, for obvious reasons, given by highly accentuated sword movements that all riding behind can see – is surprisingly easy as the buildings on the three sides of the parade ground provide excellent acoustics. One top tip Colonel James offers to anyone planning their own birthday parade is to half turn your head before shouting your word of command. Not only does your voice then travel that bit more backwards and towards the men behind you but the fact that your head half turns then wakes up even the doziest trooper who now knows something is about to happen. Even the horses will pick up on that movement. 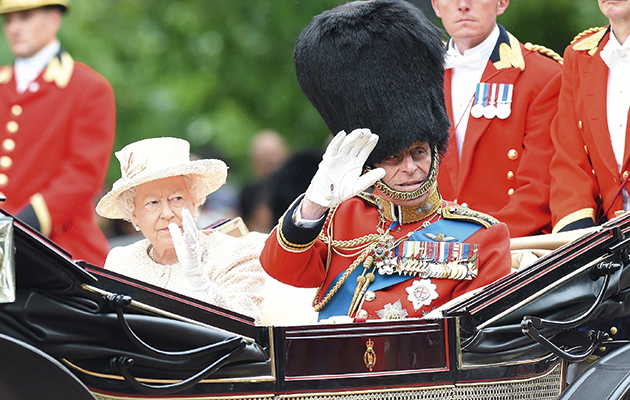 HM The Queen and HRH Prince Philip at the 2015 ceremony. And then all is jingling harness, the muffled thud of myriad hooves, the banging of aiguillettes on breastplates, the rattling of scabbards on saddles, drowning out all other noise. Then, as Colonel James put it, the best moment of all for an officer: the moment he rides past his monarch, looks her in the eye and salutes her. In fact, and while they were all busy saying that it would be business as usual and they would just be doing their job, they all, from colonel to trooper, admitted that on 11 June they would be aware they were going to be part of history. And that is something of which every member of the Household Cavalry Mounted Regiment is immensely proud.